Being called for an interview from your college is the biggest achievement of course. So once you receive it, don’t forget to be proud of yourself. Not all students are as talented and as skilled as you are according to the interviewers. You have to be able to establish a good relationship with those who can be considered the gatekeepers of the college. Therefore these university interview tips enlisted in the paragraphs below will surely help you get ready for that big occasion you are looking forward to. 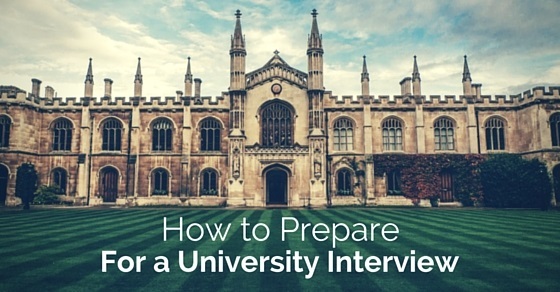 How to Prepare for University Interview for Admission? The following mentioned for few tips for interview that help in preparing for university interview. Before you attend an interview, it is always important to prepare for interview. You should be ready to answer almost anything that is asked to you. Your interviewer will expect you to have certain questions already prepared in mind. Some of them include talking about your past and school/college experiences. Be prepared to answer all of them. Then you should also put some energy to rehearsing and practicing all your answers. Also try to prepare creative answers. Don’t say something that is already available in some of the websites. Do something unique and out of the box. Most of the interviews run for 30 minutes up to an hour. Most students are at times told that the sign of a good interview can be a long one as well. But when it comes to campus interviews, they are always scheduled one after the other and most interviews that are off the campus are performed by the members of the alumni who are also working as professionals. So you may expect the interviewer to be on a very tight schedule. If you have seen them checking the time, then it is not necessary that they think you are a boring person or something like that. So don’t worry about timing. You can also send a thank you note if you want to make an good and long lasting impression. If there is something that you found very helpful during the interview, then you may allow the interviewer to know about. If you are also connected with the interviewer on a brook or maybe common experience or even if you have the same music taste, let them know about it as well. While attending an interview, don’t forget to be confident. You have to show how capable, talented and full of potential you are. You must show and display your talents. In order to succeed in any interview, you must possess confidence without which it is nearly impossible to crack a difficult interview. So make sure you have prepared yourself accordingly. Show them what you are all about! You might have several sides so you have to show the side of yourself which is very professional, poised and mature. You have to show the most elegant and best side of yourself as well. So don’t just show up there like you have just lifted yourself from the couch. In other words, don’t just wear what you want. You have to put on clothes that make you look and feel confident. Also just make sure you are smiling and show some kind of elegance. Make sure you speak with clarity and look into their eyes while speaking. Make sure the clothes you are wearing are well ironed and clean. Remember that the key to landing the best college in an interview has always something to do with matchmaking. You really don’t have to be someone else in order to do well. So if the person has been interviewing you, make sure you are being yourself. Before the interview begins, you have to see why this particular college appeals this much to you and what you would like to study. You should also speak about what you want to do after graduating from that college. It will take you a very long way. College is all about learning to live the right way. You must show that you are an independent person and that you don’t dwell on someone else’s choices. So when you get ready for that university interview, get ready to show all these people what you are about. The interviewer is not just look at you as self sufficient just because your parents are seated right beside you. Plus if you look like you are very much dependent on your parents and look up to them for almost everything, it could be a great way to just kick and ruin all the impression that you have made so far. So our suggestion to you would be to show that you are independent. Look sharp and sit straight. Most of the college admission interviews are hoping to know the sort of person you are. The interviewer will be able to tell a lot about if you just blurt out all researched answers. So you should always have a good and general idea of the stories as well as examples that you are keen on sharing. Those dreams that are memorable to you and speak about your unique qualities is what really matters. You should be able to answer smartly according to the question that is thrown at you. Therefore it is our suggestion that you keep away from too much research! If you do not open yourself to the interviewer, they wont be able to know you as a person. In short, you will not be able to crack that interview. Also if you come across as a timid and shy person, it could leave the impression that it is hard for you to adjust with people and that you aren’t all that able to participate in all the discussions in class. So we would suggest you to be ready with some general remarks from beforehand so that you can deal with the shyness and stop looking timid. Start off topics that are easy and then go ahead and practice with a friend. Talk about your college experiences in front of the mirror. See where it takes you! You should also set some time apart so that you can research and get to know stuff about the school. Prepare some questions from beforehand and check with yourself if you know enough or not. Not doing any research on the school can really cost you. It is detrimental to your future and will always be a drawback. So make it a point to know as much as you can about the school because questions related to it will be asked for sure. Always remember that college admission interviews are basically getting to know what you look like as a person. So if you show that you have rehearsed the answer a hundred times (which is very easy to catch), chances are you will not crack the interview. You should have a good and general idea of the stories and previous experiences that you’ve had so that you can speak about them and what makes you so unique. You may craft your answers for sure but don’t make it look like you have learnt like a piece of poem and you’re up there for recitation. Even though it is important not to stay so humble that you forget to say anything that is positive about you, especially when you are asked about the accomplishments you’ve made so far, just be careful that you are not going overboard at any cost. If you keep bragging about yourself, the impression will be very bad. It is okay to speak about your achievements but the bottom line is you should not come across like a show off. There are a couple of common interview questions that you should master before attending an interview. Some of the university interview questions are very basic and specific while the others are slightly unique and creative. So get ready to answer all these types of university admission interview questions if you want that seat in your favourite college! Questions asked like this could turn a bit sour if you end up making the mistake of dwelling on your past and speak about the wrong things that you have done. You may always put a positive spin to it by saying something you have missed out on. Say that you loved to act and sing but because of study pressure you couldn’t make the time for it. You may also speak about how much you loved reading the school newspaper and magazine and editing that would be your dream but unfortunately you weren’t lucky enough to make that happen. The interviewer is on a mission to understand a few things about you by asking this question. First of all, they want to know how much you have read or claimed to have read. Second, she wants to know your skills and sense of judgement. She or he will get to know the kind of books that you enjoy and what you think would be correct to offer someone to read during an interview. In cases like this, you may always mention smart books such as To Kill A Mockingbird or one of the books that have won awards or a Pulitzer Prize. 15. What are the fun things you like doing when free? To answer a question like this, you cant say basic things like “chilling’ or “hanging out with friends”. College life is not all about work so basically you are expected to answer this question lightly. You may say that you love reading, writing or playing a sport. Say that you like to balance your life with a whole range of activities. If you like both swimming and playing hockey, mention it. And if you like both sports and reading, mention that as well. Just show how strong and versatile you are. The questioned has been designed to see how well you can solve problems. When you have been given a challenge, how to deal with the situation? How do you handle it? Your college shall always be full of different challenges so the college will always want to see if the students who have enrolled are capable of handling them. Plus when you speak about a challenge you have overcome, you set a good example and show your abilities. So if a question like this comes, answer it professionally. If you follow all of these tips and ideas, you will surely be able to crack that university interview. And even if you don’t, don’t worry! There are so many other colleges waiting for you. So just give in your best and keep those fingers crossed. Who knows what you might land? On that note, good luck! And if there is some feedback you would like to give, feel free to drop in a comment below. We are always eager to hear from you. Previous articleIdeal or Perfect Salary for Happiness: How to Achieve it?